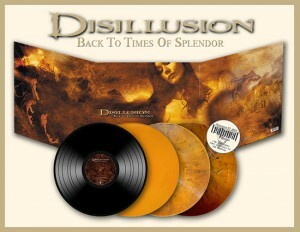 Considered as one of the best and innovative Heavy Metal albums ever to come out of Germany, Metal Blade Records has decided to re-issue the classical DISLLUSION album “Back To Times Of Splendor” on the 27th of November, 2015 on vinyl. It’s the first time ever this album will be available on vinyl! The triple gatefold double-LP will be released in four different, limited editions (180 g black/orange/amber/Leafmeal). The first three editions can be pre-ordered HERE. The Leafmeal edition will be available exclusively at the Leafmeal Festival (facebook.com/leafmealfestival) taking place at the FZW in Dortmund, Germany on release date, the 27th of November where DISILLUSION will play a special “Back To Times Of Splendor”-show (tickets: metaltix.com).